rubicon4wheeler: Power Retractable Hardtop and Solid Axles for the Next Wrangler? Power Retractable Hardtop and Solid Axles for the Next Wrangler? We heard some rumors that Jeep is considering a power retractable top for the upcoming fourth-gen Wrangler, although it is still in the very early stages of development. If it does make it to production, such a top would likely be a high-priced, niche option for buyers who don't want to be bothered with manually retracting soft tops or heavy, bulky removable hard tops. Such a feature would surely expand the appeal of the Wrangler to folks without the DIY sensibilities needed to retract the complex soft top. 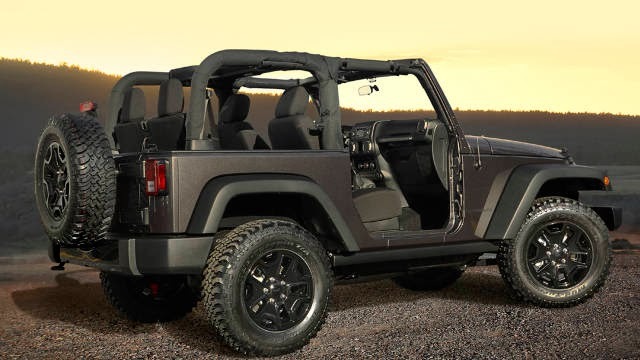 This will certainly help increase the Wrangler's appeal among the faux-wheeler crowd, which in the end is a good thing because more sales of the Wrangler is the better for everyone in the Jeep market.
. . . removable doors are still on the table, and Jeep is also looking to redesign the Wrangler's frame to deliver a smoother ride while keeping the solid axles. Removable doors are a no-brainer; they are simple and inexpensive to implement, and they are one of the Wrangler's signature features. The news about the solid axles, if true, is a boon to 4-wheelers and the entire Jeep aftermarket industry because, simply put, independent suspension cannot provide the articulation, durability, simplicity, modifiability, and cost that Wrangler owners and the Jeep aftermarket industry require from the vehicle. The small tradeoffs in weight and aerodynamics are inconsequential compared to the compromises that IFS/IRS would make to the vehicle. A Wrangler is not a Wrangler without two heavy-duty solid axles. With every other Jeep-brand vehicle having already been castrated with independent front and rear suspension, the brand's mystique absolutely requires that the Wrangler continue into the future with its benchmark-setting, reputation-establishing offroad abilities that only a proper pair of solid axles can provide. Sales of every other Jeep vehicle will suffer if the next Wrangler's offroad ability is restrained and the brand's image therefore compromised.